Includes a TOAKS Titanium 550ml Pot, a folding stove, a TOAKS Titanium Folding Spork, a titanium windscreen and a mesh storage sack. I recently stumbled across the TOAKS Ultralight Titanium Cook System while searching for an ultralight, packable stove and cookware set that is both easy to use and very durable to include in my family’s bug-out bags. 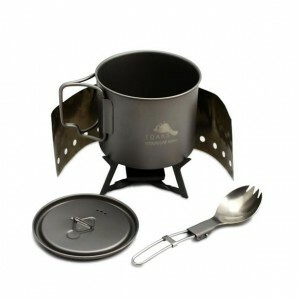 This cookset consists of a TOAKS 550ml titanium pot, a folding solid-fuel stove, a TOAKS titanium folding spork and a titanium windscreen. When I first opened the box, I found the 550ml titanium pot with each of the smaller parts packed neatly inside with plenty of room to spare. Each part was packed individually in small nylon pouches which help to keep them from rattling around when they are packed away. Total entire weight of the kit, pouches and all is about 4.73oz (134g). The extra space is perfect for storing Hexamine tablets, a lighter, condiments and some additional cooking utensils. The TOAKS titanium spork is a durable fork/spoon combination weighing only 7 tenths of an ounce. This model is 3.5″ in length when folded, and 6″ in length unfolded. There is a small siding lock to keep the Spork from collapsing while in use. The 550ml titanium pot features a foldable non-coated wire handle, a titanium lid and an orange mesh pouch. Made from titanium, the pot and lid are very lightweight and extremely durable. Altogether, the pot and lid weigh only 3 ounces combined. I found the pot was tough enough to support a 220lb adult standing on its end without collapsing it. However, I certainly would not try that while on its side. Although the pot can hold a full 2-1/3 cups (550ml) when filled to the brim, I found that it actually worked best with 2 cups (473ml) or less. It is certainly small enough that it could also be used as a cup or small bowl. Note: The handles can become much too hot to touch without some sort of hand protection. The lid includes a rim so it will not fall into the pot, a small wire handle and three small vent holes. While the lid fits well enough to boil water and not fall in, it is not by any means a snug fit. I really wish the lid fit more securely. Its main pouch is made from a durable dual-layer nylon mesh material with a form-fitted flat bottom and a draw-string with a cord-lock. Not only does the pouch keep the kit protected, it could also be used as a coarse filter if you ever needed one. I do wish they had used the same higher-quality cord-lock that had provided with their 1600ml pouch. The windscreen is a thin titanium film weighing almost nothing at 22 hundredths of an ounce. It can be used to completely encircle the stove to prevent a flame blowout. The windscreen is so light, it can easily blow away. Therefore, I recommend using a small clip or paperclip to keep the ends held firmly in place. 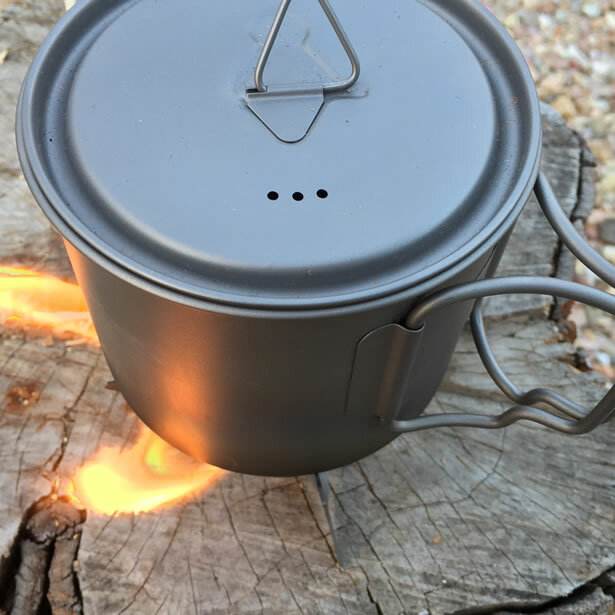 The titanium tripod stove is designed for use with solid fuels including Esbit and Hexamine tablets which can be purchased online or from most outdoor sporting goods stores. Half a tablet is typically enough to boil 2 cups (473ml) of water. With a full tablet, you should be able to heat enough water for a hot drink and a warm meal in a little under 20 minutes. The small nylon bag provided keeps the tab residue from getting on everything when it is stored away. The pot is relatively easy to clean, especially with a little camp soap and a scrub pad. Additionally, if you apply a thin layer of soap to the bottom of the pot before each use, the residue will wash off rather easily. With the extra room in the pot I decided to pack a few packets of crushed red pepper, a few packets of salt, pepper and bouillon cubes in a small ziplock baggie, a P-38 can opener, a small tube of toothpicks, a small bic lighter, a tube of waterproof matches and a small Swiss Army knife leaving a little room to spare. Finally, I added five coffee filters wrapped neatly around the pot at bottom of the main pouch. I prefer to keep the Esbit or Hexamine tablets packed separately rather than inside the pot as they tend to smell bad and cause the metal to pick up a nasty taste. The TOAKS Ultralight Titanium Cook System is a wildly impressive stove and cookware set. Weighing in at less than 5 ounces coupled with its remarkably small footprint make it an ideal option for both hikers and survivalists alike. Whether you are bugging out or on a 25-mile trek, as long as you have plenty fuel to feed it, this cook system will get the job done time and time again. While it may cost a bit more than some of the cheaper options out there, it is really the extreme durability and ultra light weight of the titanium that you are paying for. Certainly an attractive alternative nonetheless.